He started 2007 firmly established as India’s captain, with a Test average of almost 57.5 and his enduring image as `The Wall’ only slightly dented as a result of one poor series in South Africa. At the end of the year, he is back as a player, having resigned the captaincy, his average has fallen to 55.4 and his image as `The Wall’ has been further dented following sub par scores against both England and Pakistan with only one century against Bangladesh for what it is worth to show on the plus side. He ended an eminently forgettable year by copping his share of the blame for India’s crushing defeat at Melbourne thanks to a tardy approach which saw him negotiate 180 balls for a measly tally of 21 in the two innings. It certainly wasn’t Rahul Dravid’s best year in international cricket. For over a decade, he had provided stability, substance and style to the Indian batting in both forms of the game topping the 10,000 run mark in ODIs and the 9,000 run mark in Tests. Indeed at the end of the series in the West Indies in mid-2006, he had the highest average (58.75) for any batsman with an aggregate of over 5,000 runs in Test history - of course with the exception of Don Bradman. The slide started in South Africa even though his stature as a captain stayed high with the series victory in the Caribbean and the historic maiden Test win in South Africa. 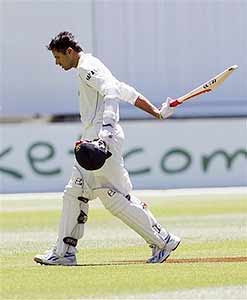 Despite the subsequent loss in the series Dravid remained entrenched as the captain. Back home, he looked ahead to leading India in the World Cup in the Caribbean and successive victories over West Indies (3-1) and Sri Lanka (2-1) put the Indians in the right frame of mind for a strong World Cup challenge with Dravid himself in good nick crossing the 10,000-run mark in ODIs. Hardly anyone could have foreseen that the darkest chapter in Dravid’s career was round the corner. Against all expectations, India lost to Bangladesh by five wickets and this immediately put them under pressure. A runaway 257-run win over Bermuda during which they notched up the highest total in World Cup history gave them more than a ray of hope but they still had to beat Sri Lanka in their final group encounter to qualify for the Super Eight. However the millions of Indian cricket fans the world over were stunned when Sri Lanka won by 69 runs to knock out India from the tournament. The mood in the immediate post World Cup period was predictably ugly and incensed fans hurled stones at an under construction house owned by Dhoni in his hometown of Ranchi while effigies of Dravid and coach Greg Chappell were burnt in various places around the country. The post mortems started and the debacle was even discussed in Parliament. Dravid and Chappell were squarely in the firing line but not surprisingly it was the latter who became a vilified figure. He had been the subject of much criticism for his policy of over experimentation and cricket fans held him more responsible than Dravid. On the team’s return, even as Dravid kept his thoughts to himself Chappell went from bad to worse blaming the selectors for picking the wrong team for the World Cup and the senior players who he said operated like a `mafia’ ganging up against the juniors. Less than a month after the disastrous campaign, Chappell, sensing the public mood, quit but there was never any chance of Dravid being axed as captain. He kept the post for the tour of Bangladesh and knocked up his 24th Test century at Dhaka while the team predictably emerged victorious in both the Test and ODI series. By the time the Indian team left for England, Dravid felt relieved enough to announce that ``the team has moved on from the World Cup.’’ A 2-1 victory in the ODI series against South Africa in Ireland put the team in a confident frame of mind for the tougher tasks in England. But while luck deserted him as a batsman it stayed with him as captain. Fortunate to get away with a draw in the first Test at Lord’s, India were 98 runs adrift of victory with just one wicket in hand, Dravid won a good toss in the second Test at Birmingham, promptly put England in to bat in bowler friendly conditions and the result was a meritorious seven-wicket victory. Up 1-0, the Indians were in a position to make it 2-0 in the third Test at the Oval when Dravid took one of the most inexplicable decisions of his captaincy. India piled up 664 and England were dismissed for 345 early on the fourth morning. The situation cried for the fielding captain to enforce a follow on but to general astonishment Dravid opted to bat again. It was not just exhibiting a defensive mindset it was quite meaningless made even more so by the skipper taking 96 balls to score 12. England given a lifeline saved the game comfortably and Dravid’s leadership qualities became the subject of debate. However with the Test series won - the first time in 21 years that India had won in England - and with the ODIs lost by the narrow margin of four matches to three Dravid came back with his reputation more or less intact with only his run famine a cause for concern. 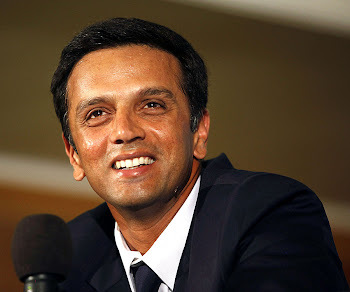 Actually, Dravid had given broad hints as to what was to come in the course of a revealing interview to former England captain Mike Atherton in England during which Dravid spoke out his mind. Asked if he found leading a cricket crazy nation a burden Dravid said ``Burden is too strong a word and people say that because of how I look. I am not naturally a cheering looking soul on the field. I do enjoy it but there are aspects I find tough. What I find hardest is the absolute lack of proportion. It makes it very hard to build a team when two or three bad games provoke such an extreme reaction.’’ Asked whether becoming only the third Indian captain to win a Test series in England would shift public opinion back in his favour Dravid replied "Ah, but that will be quickly forgotten if we lose the one-day series." Cynicism was not a quality that one associated with Dravid but there was little doubt that he was becoming increasingly intolerant of criticism. Even though he came across as an erudite and confident personality, the growing criticism against his leadership, which ranged from the indifferent to the predictable, from the curious to the defensive took its toll. The tour of England was evidently the last straw for Dravid who took a number of incorrect decisions and was hauled over the coals. The decision not to enforce the follow on at the Oval was woefully incorrect but Dravid defended himself by the age old cliche of the bowlers being tired, a view that was challenged by his spearhead Zaheer Khan in the course of a TV interview. Dravid also made wrong decisions in the ODIs as on more than one occasion he put England in to bat after winning the toss and in excellent batting conditions the hosts made hay while the sun shone on their way to winning the matches. Surely, the series could have ended in India’s favour had only Dravid opted to bat in the first and third ODIs both of which England won after being inserted. There were also rumours that selection committee chairman Dilip Vengsarkar, who was in England, was interfering in matters of team strategy and this had led to sharp differences with Dravid. But in the ultimate analysis Dravid will be remembered as a batsman who rose to every challenge and as a captain who turned his back on a challenge. Having opted out of the Twenty20 World Cup, Dravid found runs hard to come by in ODIs and after an unproductive run of 80 runs in nine innings including three ducks he was axed and by the end of the year had still to regain his place. Despite his lean trot, there was never any talk of him being axed from the Test squad. He just needs one profitable outing to get back his confidence and whatever his limitations as a captain it is obvious that he still has much to contribute as a batsman.